FOX News featured a program yesterday (November 18, 2007) that was rather amusing. 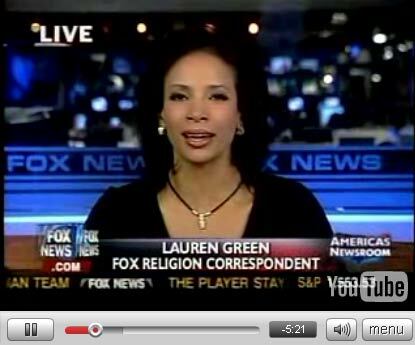 Their so-called "Religion Correspondent" Lauren Green dispensed her expertise on religion (you know, the Christian religion). Ms. Green got the job when the Muslim "Religion Correspondent" that they were going to use was hired on The View for her "extremist" viewpoint. It made me wonder though whether she corresponded directly with God. FOX icon George W. Bush claims to. During the program the camera panned over a picture of King Solomon and his consort, the Queen of Sheba (she ruled over the ancient location of Ethiopia/Yemen). Not surprisingly, the queen was lily white. It was very authentic reporting on the part of the FOX News Religion Correspondent. Of course, it would be delusional to hope that since she traveled to Ethiopia to "research" her piece, she would have noticed the distinctly tanned appearance of the inhabitants of that country.